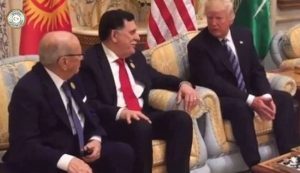 Sunday’s meeting between Presidency Council (PC) head Faiez Serraj and US President Donald Trump in Riyadh lasted little more than a couple of minutes and took some considerable effort to arrange because the American president had not wanted to discuss Libya, officials have told the Libya Herald. The two met on the sidelines of the American Islamic States Summit in the Saudi capital. According to the PC’s media office, however, the short meeting saw President Trump reaffirm full US support for Libya in its battle against terrorism and praise for Serraj’s government of national accord in defeating the so-called Islamic State, plus an agreement that the two sides should to continue to cooperate and hold future consulatation meetings. Serraj also met with US Secretary of State Rex Tillerson. Another meeting in Riyadh was with the Malaysian prime minister Najib Razak at which Sarraj explained the current crisis in Libya. The two are said to have also looked into what could be done to develop mutual relations. At the summit itself, Serraj spoke of the need to destroy terrorism in the Muslim world not only by joint action against terrorist organisations with whom there could be no bargaining, but also by confronting radical ideology. But despite the victory in Sirte, Libya was concerned that IS and those like it might establish themselves elsewhere in the country. To prevent that happening, Serraj launched a fresh appeal to end the arms embargo so that the Libyan army and security forces could deal with “this cancer”. He also made a strong appeal to the international community to put pressure on those countries which interfered in our Libya’s affairs. At one point, the accusation appeared to be directed at some of those attending. “You have to stop your negative interference”, he declared. Libyan suffering had reached it limit and could not continue. Libyans had had enough. Still in Saudi Arabia today, Serraj met members of the Libyan embassy there, thanking the chargé d’affaires and staff for the work undertaken to ensure the success of his delegation during the summit. Just days before, his foreign minister sacked the Libyan ambassador to Riyadh, Abdulbasit Elbadri, allegedly because of Elbadri’s close links to Khalifa Hafter.